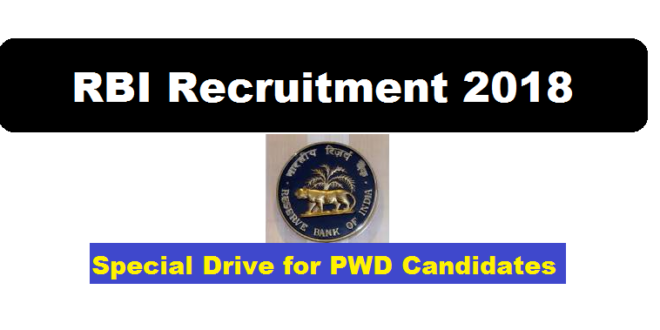 Reserve Bank of India special recruitment 2018 drive is out for PWD candidates. According to the RBI Recruitment 2018, Reserve Bank of India invites applications from eligible candidates for posts of Assistant — Special Drive for PwD candidates (27 posts) in various offices of the Bank. The Selection process for the post will involve a country-wide competitive two phase Online Examination and Language Proficiency Test (LPT). Following are the details of the posts under RBI Recruitment 2018 with post details, number of vacancies, age limit, salary, required qualification with application details. The full text of advertisement will be available on the Bank’s website (www.rbi.org.in) in the 4th week of January, 2018 and is also being published in the Employment News/ Rozgar Samachar. Applications will be accepted only online through Bank’s website. Date of Main Online Examination 07th May 2018.